With movies, hands-on demonstrations, lectures and panels, an art exhibit, and a huge research poster session a dizzying array of opportunities awaits members of the public and the Brown University community who want to learn about brain science. PROVIDENCE, R.I. [Brown University] — It’s enough to make your head spin. Throughout Brain Week RI from March 12 to 19, and then at the University's Mind Brain Research Day on March 30, the Brown campus will provide varied opportunities to learn about the brain almost everywhere you look. The events are all open to the public, though organizers encourage advance registration. Brain Week events will occur across Providence, but the kickoff at Brown will be “Heads Up! A Panel on Concussion” on Monday, March 14. Speakers will cover legal, medical and basic research aspects of severe head impacts in sports and daily life. The panel includes Robert G. Flanders, Jr. a Hinckley Allen attorney and former Rhode Island Supreme Court associate justic;, Drs. W. Curt LaFrance Jr. and Stephen Mernoff, associate professors of neurology; Dr. Neha Raukar, associate professor of emergency medicine; and research scientist and orthopedics instructor Bethany Wilcox. The event at the Alpert Medical School at 222 Richmond St. begins at 5 p.m. with a half-hour reception and light refreshments. After that, the panel will continue until 7 p.m. Meanwhile at the medical school building, the walls will display the paintings of artist China Blue through March 15. Her series “Memory Networks” explores how the connectedness of the brain embodies and preserves human experiences. In two film screenings on campus, experts will guide viewers as they explore mental illness as presented through cinema. On Thursday March 17 in Smith-Buonanno Hall 106 at 8 p.m., Ben Fortier, a veteran of the Iraq war who now works in television, will introduce the classic film “The Deer Hunter,” which raises the issue of post-traumatic stress disorder among veterans. Students and Dr. Lisa Llanas Hagberg will screen and discuss the movie "Infinitely Polar Bear," which tackles bipolar disorder. 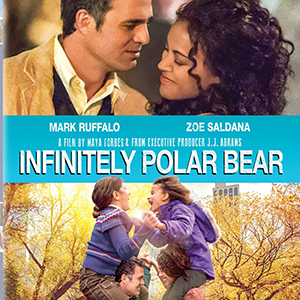 The next night at 7 p.m. in the same location, the Brown University Film Forum, the Brown Brain Bee, and Brown Neuroscience Departmental Undergraduate Group will screen the 2014 film “Infinitely Polar Bear.” Filmed in Rhode Island and starring Mark Ruffalo and Zoe Saldana, the movie portrays bipolar disorder. A discussion with Dr. Lisa Llanas Hagberg, a psychiatrist at Butler Hospital, will follow. Especially for younger brain scientists, the most popular event may be the Brain Fair on Saturday March 19 from 10 a.m. to 2 p.m in Sayles Hall on the College Green. “Many of the exhibits are ‘hands-on,’ like an anatomy station with real human brains on display, a microscope station, an EEG station, and an arts and crafts station for younger children,” said organizer Victoria Heimer-McGinn, a postdoctoral scholar in Brown’s Department of Cognitive, Linguistic and Psychological Sciences. “Some labs will use games to illustrate key concepts. For instance, one lab will use optical illusions to show how vision is processed in the brain, while another lab will use memory games to explain how the brain learns. In all, 22 labs, three student groups, and three community organizations will exhibit. 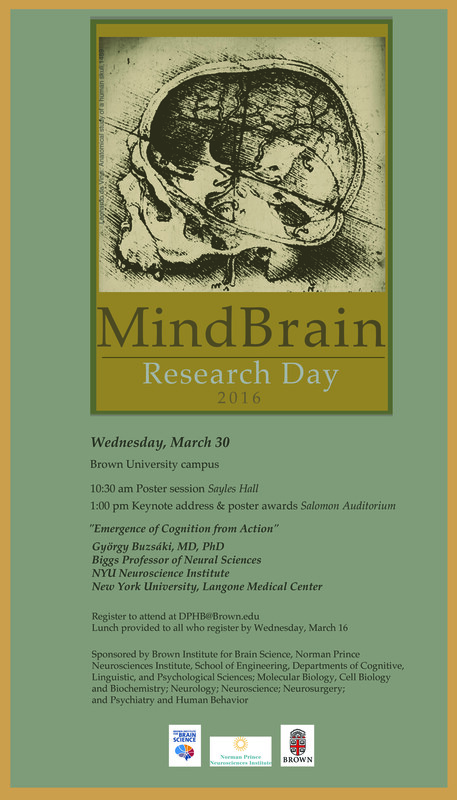 Even after the Brain Fair has wrapped up Brain Week RI, people can bring their rapidly advancing brain science knowledge back to Sayles Hall on March 30 at 10:30 a.m. for Brown’s annual Mind Brain Research Day. Researchers from Brown and its affiliated hospitals will pack the hall with about 150 posters explaining their latest work in psychology and psychiatry, neuroscience and neurology and public health and medicine. Students, faculty members and research staff will be there to answer questions about their work. The main sponsors of Brain Week RI are the Cure Alliance for Mental Illness, The Brown Institute for Brain Science (BIBS), the Norman Prince Neurosciences Institute (NPNI), and Butler Hospital. BIBS and NPNI are also sponsors of Mind Brain Research Day, as are the School of Engineering, and the Departments of Cognitive, Linguistic, and Psychological Sciences; Molecular Biology, Cell Biology and Biochemistry; Neurology; Neuroscience; Neurosurgery; and Psychiatry and Human Behavior.